I’ve spent a lot of time in New York this month and it’s really making me miss it! I was in town two weeks ago for the Veuve Clicquot Polo Classic and then flew back into New York last Thursday and headed out east to Montauk on Friday afternoon. 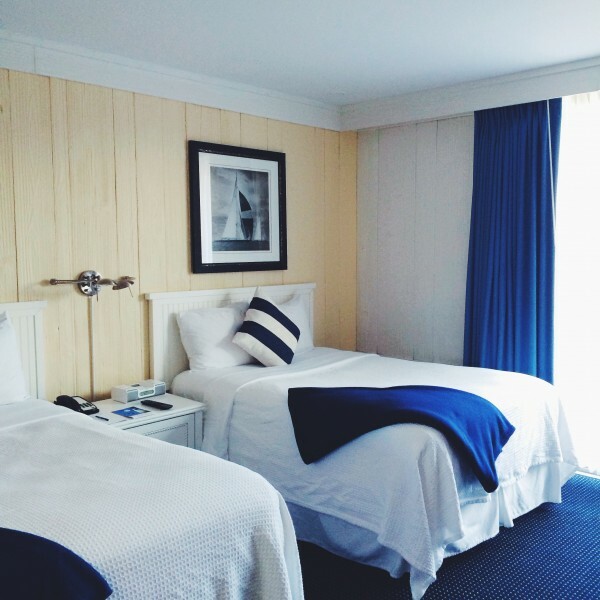 Montauk has always been one of my favorite places to stay in the Hamptons (remember this trip?) and this weekend was just as great as it used to be! I couldn’t believe it’d been two years since I’d been out east. Since I moved from New York to Chicago last summer, most of my summer was consumed with moving tasks and to-do’s and I wasn’t able to make a trip to the Hamptons before the big move to the Midwest. I’ve stayed in houses and AirBNBs previously, at Montauk Yacht Club two years ago, and at Solé East Beach this past weekend. There are pros and cons to all of them, depending on what you’re looking for. Houses and AirBNBs are great if you have a lot of people, and they provide you with the most flexibility. However, based on location, you’re probably going to need to rent a car or just plan on calling a taxi to go everywhere. With a lot of houses, there are nightly and weekly minimums, so it’s harder to find one for just one weekend. There are quite a few hotels right in town in Montauk (Montauk Beach House, Solé East Beach, and more) and it’s so nice being able to walk to get coffee in the AM, walk to breakfast, walk to shop, walk to SoulCycle, walk to the beach, etc. The ‘downside’ would be that you can’t pack a lot of people in so hotels are generally best for smaller groups. They can be pretty costly during prime weekends, too! 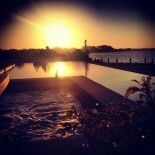 Other great hotels… Gurney’s, Surf Lodge, Crow’s Nest (gorgeous décor and the best place to take in the sunset! ), and Montauk Beach House. If you’re bringing out your dog, a lot of people go the house route, but Ruschmeyer’s does allow dogs! 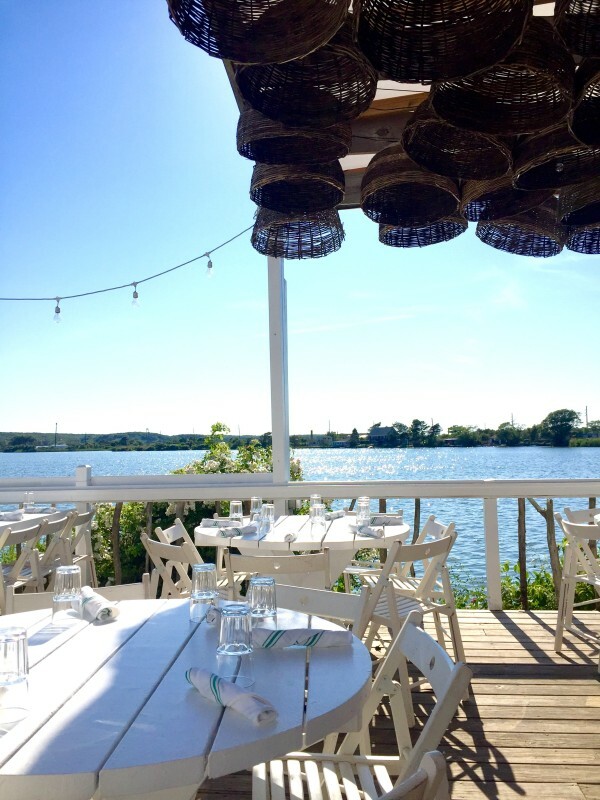 Montauk doesn’t have all of the shopping that East Hampton, Bridgehampton, Southampton, and Sag Harbor have, but there are definitely some gems that aren’t to be missed! Waves // I went a little overboard here, but it was hard not too! Similar selection as Revolve with brands like JOA, Endless Rose, Lovers + Friends, Tularosa, Frame Denim, Illesteva, etc. 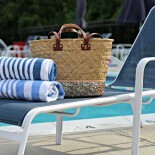 Poolside // Amazing selection of sunglasses, bikinis, clothing, and the infamous Poolside Bags! Share With… // A random assortment of things, but a really great selection of beauty products (think Tata Harper), Ropes Maine bracelets, Kempton leather goods, Apolis totes, etc. Shark Bites // Lots of random things, but a cool selection. 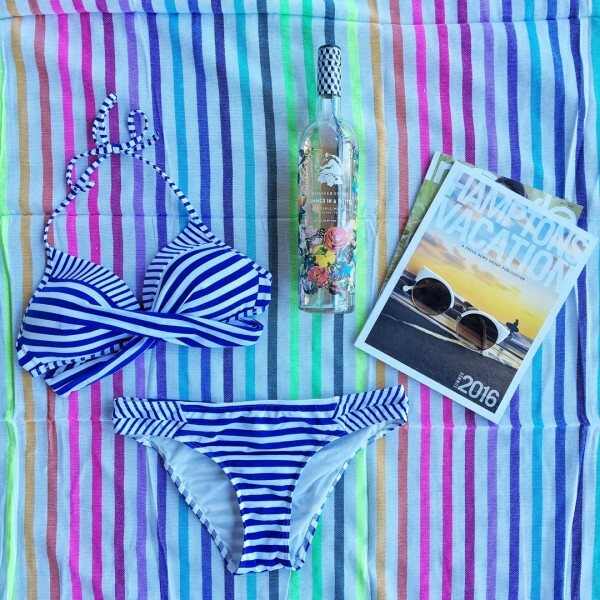 I got a pair of sneakers, this beach blanket, and some plastic wine glasses. Gansett Lane Home // Unbelievably chic home store… I wanted to move in! Lots of affordable little decor pieces, too. Tacombi // Great spot to grab lunch, lots of outdoor seating, too! Surf Lodge // The place to be on Saturday nights! My suggestion is making a dinner reservation and staying after dinner so you don’t have to deal with the line situation. 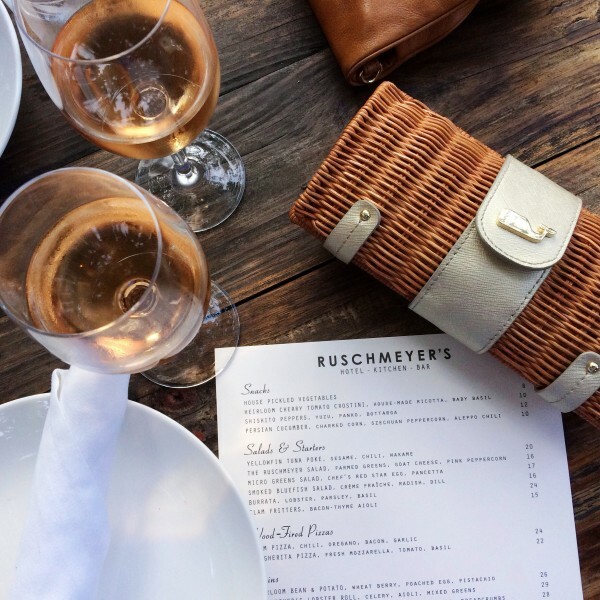 Ruschmeyer’s // Good for dinner, also fun for going out! Maybe I’ve just gotten too old, but I did feel like Ruschmeyer’s had gotten kind of “young.” It was still a good time, but I preferred to be outside under the twinkly lights vs inside on the sweaty dance floor. Bliss! // Great place to grab coffee… Lots of outdoor seating, too! 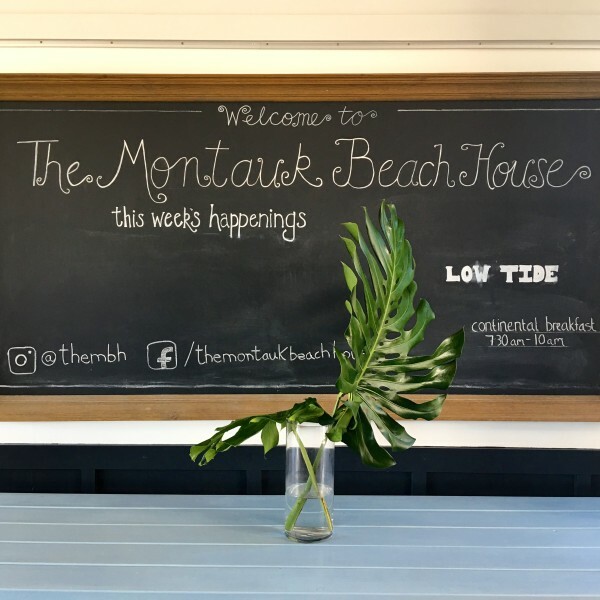 Montauk Bake Shop // Their breakfast sandwich on a croissant is not to be missed! If you’ve got a sweet tooth, definitely pick up one of their baked goods. The almond croissant was so good! Joni’s // Their breakfast wraps, smoothies, and acai bowls are so good! Be prepared to wait, though, as the line can get super long. (Also worth noting: you can only get acai bowls until 11am.) Not that many outdoor tables, but you can always wander and find a bench or go to the beach! Gigshack // Great spot for dinner! Super casual, but really good food. 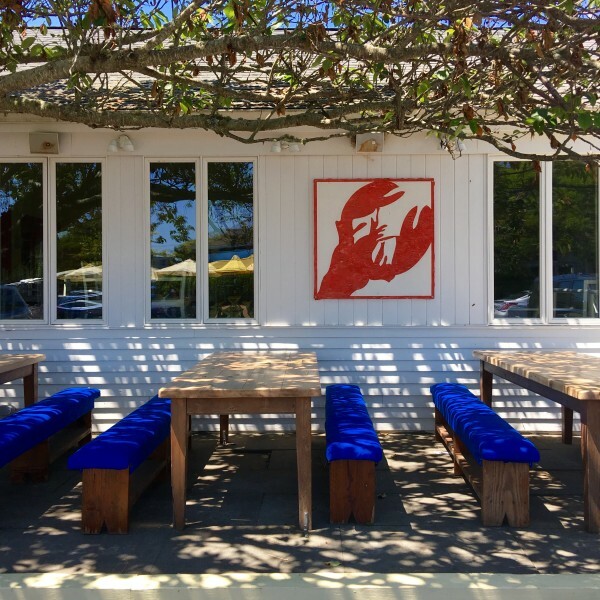 Montauk Beach House // Good spot to grab an alfresco drink. Crow’s Nest // Amazing cocktails and seriously the best spot to take in the sunset! The hotel’s décor (by Jonathan Robshaw) is absolutely amazing, too. Navy Beach // Incredible dinner on the water! South Edison // Another great spot for dinner, not too far from the beach. Get the pickle martini! 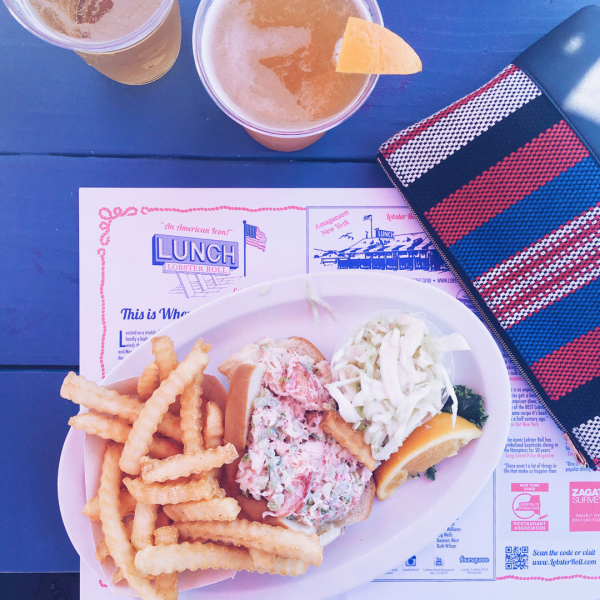 Lunch // One of the best places to get lobster rolls! It’s THE Lobster Roll Restaurant, after all. Clam Bar // Another favorite place for lobster rolls! Right across from Lunch, actually. Gosman’s // If you’re looking for a family-friendly place, this is a good spot to sit on the water and each lunch. Most weekends out in the Hamptons are spent socializing around food and alcohol, which is always fun, but sometimes it’s so nice and refreshing to do something a bit more low key! Rent Bikes and head to the Lighthouse // Be prepared though, most of the ride is along the highway! Stand Up Paddle Boarding // Lots of places to go paddle boarding in Montauk! Surfing // Montauk is a surfing community at it’s core… Take a lesson from one of the locals! 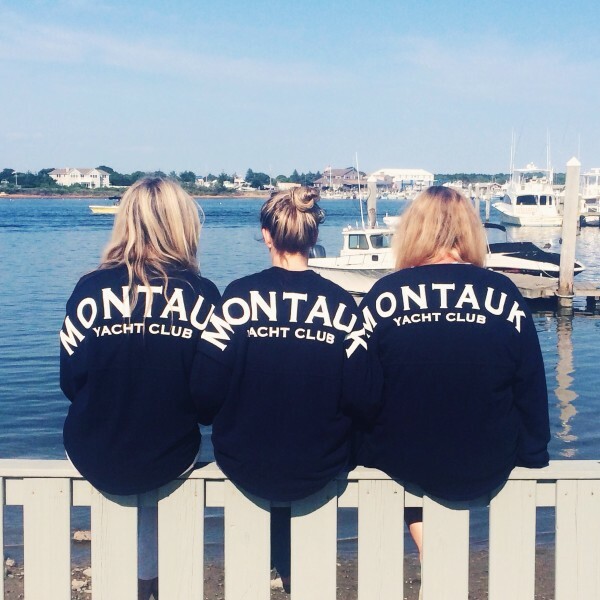 Where to Stay, Where to Shop, Where to Eat & Drink, and What to Do in Montauk! Loving all of the recommendations! 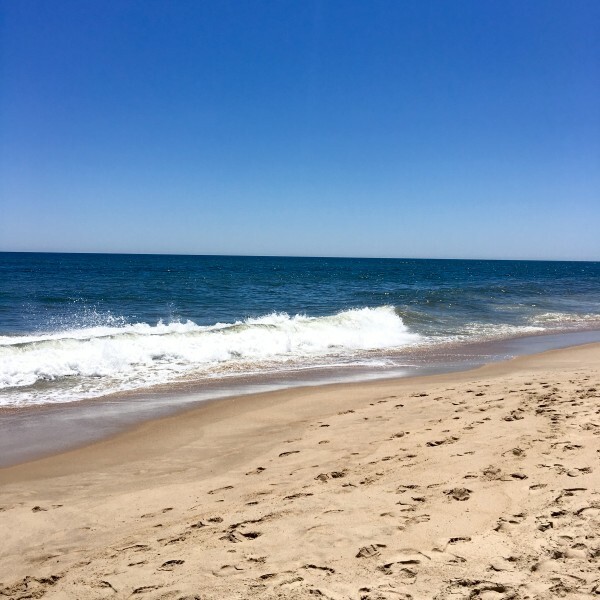 Montauk has been on my travel list, and I think this post just bumped it up a few spots! I love your swimsuit and sweatshirt….too cute!!! Looks like you had a great time! Love the photos and tips! This is so great — thank you for this post!! I’ve been dying to get to Montauk, and I will absolutely refer back to these recommendations when I go. My husband and I are planning a trip to the Hampton’s very soon. There will be a bunch of our other married friends coming with us too, so we were thinking about renting a house there. I am glad you pointed out that it is harder to book one just for a weekend. It think we are planning on staying longer, but it is still good to know. Just in case!